The coastal and marine habitats described here encompass the area from the 3 nautical mile outer limit of Oregon’s territorial sea, where water depths average 66 m and range from 17 m to 194 m, to the supratidal areas of the shoreline affected by wave spray and overwash at extreme high tides and the portions of estuaries where species depend on the saline waters which enter from the Pacific Ocean. These are the waters and habitats that define the Nearshore ecoregion and are the focus of the Nearshore Strategy. This chapter describes how to classify habitat types and the major habitat types found in Oregon’s nearshore, including: neritic, soft bottom subtidal, rocky subtidal, rocky shore, sandy shore and estuaries. Riverine portions of estuaries are currently covered in the Oregon Conservation Strategy. The distinct suite of oceanographic features and physical forcing agents that help define the Nearshore ecoregion include the northern portion of the California Current System and the annual seasonal upwelling/downwelling cycle that are responsible for its high productivity (Figures 6.1 and 6.2). 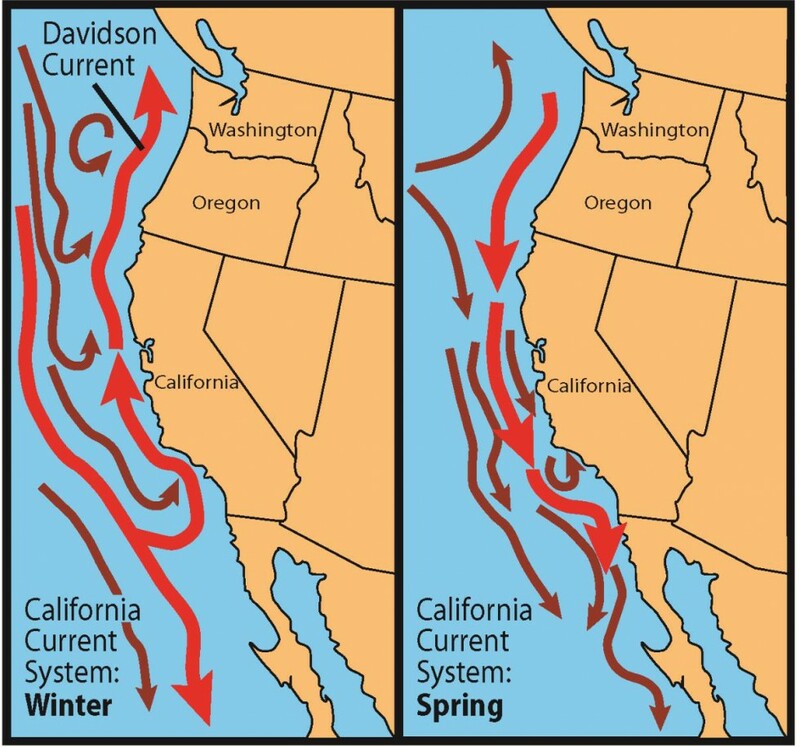 The eastern boundary current called the California Current System is a part of the North Pacific gyre that moves cold water from the North Pacific toward the equator. It has a southward flowing current over Oregon’s shelf and slope and a northward flowing undercurrent over the slope in spring and summer. In winter, the current over the shelf consists primarily of the northward flowing Davidson current (Figure 6.1). During spring and summer, winds blowing from a northerly direction drive an upwelling system that brings cold, nutrient-rich, and oxygen-poor waters from depth up onto the continental shelf (Figure 6.2a). The upwelling process is highly variable on many time scales and is generally stronger and more persistent on the south Oregon coast and more intermittent on the central and northern Oregon coast. 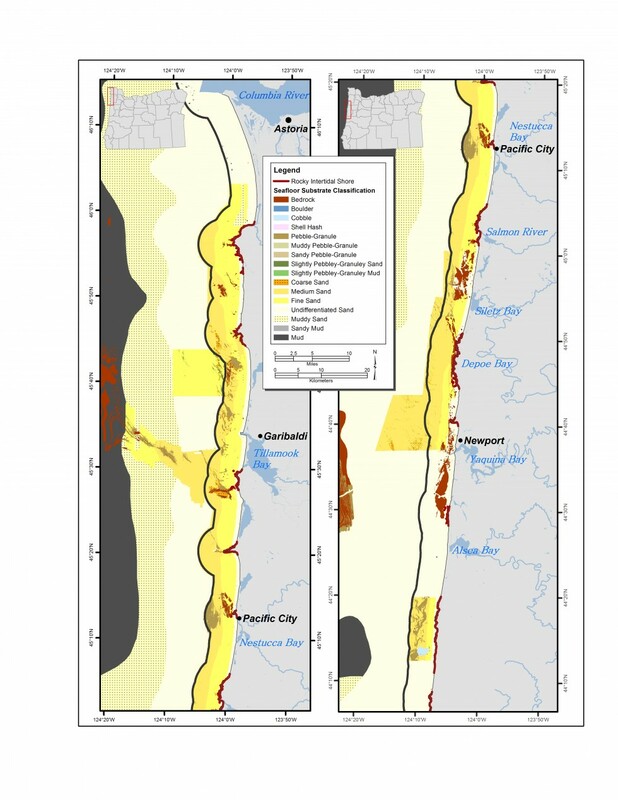 In addition to nutrients derived from upwelling, river discharge from the Columbia River provides a major source of nutrients to the Oregon continental shelf, especially along the north coast. 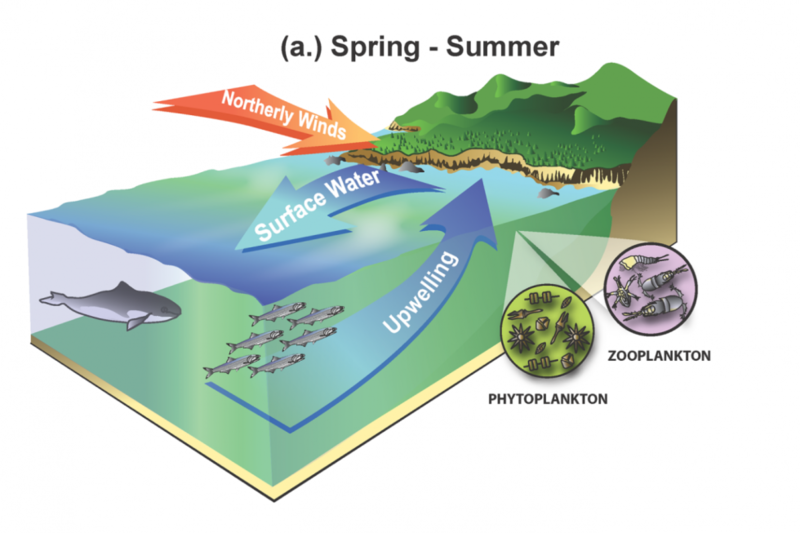 The upwelling and river-plume nutrients fuel high phytoplankton productivity which drives an extremely productive marine ecosystem off of Oregon. 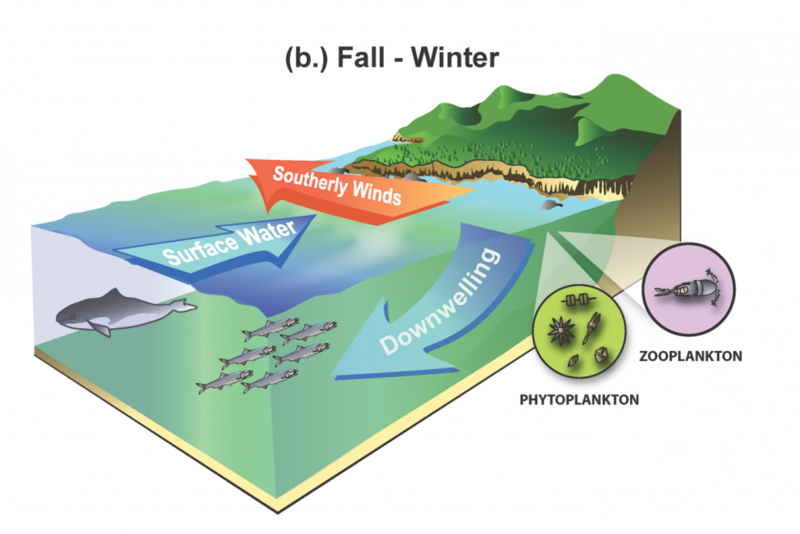 In the fall and winter months winds blowing from a southerly direction cause seasonal downwelling that bring well oxygenated water from the surface downward in the water column (Figure 6.2b). Superimposed on these large-scale processes are smaller scale eddies, gyres, fronts, and other oceanographic phenomena, which together serve to create a complex spatially and temporally dynamic ecosystem. Figure 6.1. The California Current System typically varies seasonally. (Source P. T. Strub). Figure 6.2a. Annual seasonal cycle of spring-summer upwelling. Figure 6.2b. Annual seasonal cycle of fall-winter downwelling. In 2012 the Coastal and Marine Ecological Classification Standard (CMECS) was adopted in the United States (Federal Geographic Data Committee 2012) as a means to provide a common framework for describing habitat, using a simple, standard format and common terminology (Figure 6.3). The goal of using CMECS is to both enhance scientific understanding and to advance ecosystem-based and place-based resource management through better communication. As the name implies, CMECS is increasingly being incorporated into scientific descriptions and being used in management documents. For the 2016 Oregon Nearshore Strategy, components of the CMECS classification framework have been incorporated – in particular, the CMECS approach to evaluating and describing habitats. The CMECS framework is flexible. It allows classification and description of habitat using one or both of its two broad based settings and one or more of its components. Not all settings or components need be used for all purposes. It is designed so that the components selected can effectively describe the ecological units observed to the level of detail needed by a broad range of users across a wide variety of spatial and temporal scales. The components utilized may vary depending on the objective, but the common system of standards provides comparability. For example, both anthropogenic and naturally-occurring physical structures in an environment are geoform components in CMECS. Geoform components describe the physical structure of the environment across spatial and temporal scales without affecting the larger classification of the system, subsystem, or zone. It helps to think of systems, subsystems, and zones as being like nouns, with geoform and other components being like adjectives used to describe that noun. Biotopes, the combination of abiotic habitat and associated species in the CMECS framework have yet to be fully described for most coastal and marine waters in the U. S. including Oregon. Figure 6.3. Overview of the Coastal and Marine Ecological Classification Standard framework (Source FGDC 2012). The Biogeographic Settings have a hierarchical structure composed of Realm, Province, and Ecoregion. The hierarchical structure of Aquatic Settings are composed of System, Subsystem and Tidal Range. Tables 6.1 and 6.2 provide the reader with an overview of the Biogeographic and Aquatic Settings for the species and their habitats in Oregon’s coastal and marine waters encompassed in the Strategy. The descriptions of familiar Nearshore habitats (below) will include some of the relevant CMECS components for each habitat described. Use of CMECS is just beginning. It will evolve over time as it is put to more use and information that has been collected is put into the framework. This is a work in progress that is anticipated to benefit scientific research and monitoring efforts, management decisions and conservation efforts and actions over the decades to come. The definitions in CMECS were drawn from Spalding et al. 2007. The habitats identified here are described and classified by additional Water Column, Geoform and/or Substrate Components. The Oregon Ocean Management Plan established that the marine interest of Oregon and its citizens extends to seaward to the continental margin which includes the Offshore and portions of the Oceanic CMECS subsytems, which fall outside the focus of the Nearshore Strategy which focuses on species and habitats within the Oregon Territorial Sea. The Riverine Open Water and Riverine Coastal subsystems are parts of the Estuarine Strategy Habitat not addressed in this document. Although these subsystems are critically important to the ecology of estuaries they are not the primary habitat for the species covered here. Riverine portions of estuaries are addressed in Estuary Strategy Habitat section of the Oregon Conservation Strategy. Habitat survey data, collected using modern high-resolution sonar technologies, now cover approximately 53% of Oregon’s Territorial Sea. This is a major improvement from the approximately 6% of the Territorial Sea that had been mapped with these advanced technologies, when the original Nearshore Strategy was published in 2006. Habitat maps using these new data and the CMECS substrate classification have been created (Figures 6.4a and 6.4b) and are a significant improvement over previous maps. 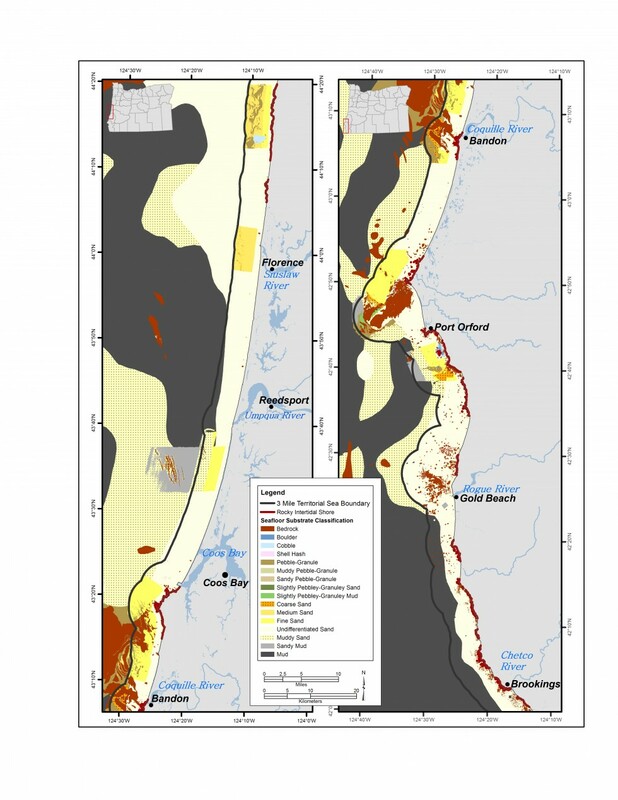 The areas that have now been mapped were chosen strategically and include almost all of Oregon’s rocky subtidal reefs. Similarly, recent mapping efforts have updated previous estuary maps completed in the 1970’s with more recent data and have started to map some of the CMECS components (see the estuaries section of this chapter). Figure 6.4a. North Oregon coast bottom substrates in marine system. Note that several abrupt boundaries evident on the map are artifacts of surveys locations not abrupt substrate changes. Figure 6.4b. South Oregon coast bottom substrates in marine system. Note that several abrupt boundaries evident on the map are artifacts of surveys locations not abrupt substrate changes. Habitat associations for nearshore Strategy Species, Watch List Species, and commonly associated species are identified to provide insight into the biological communities affiliated with specific habitats. 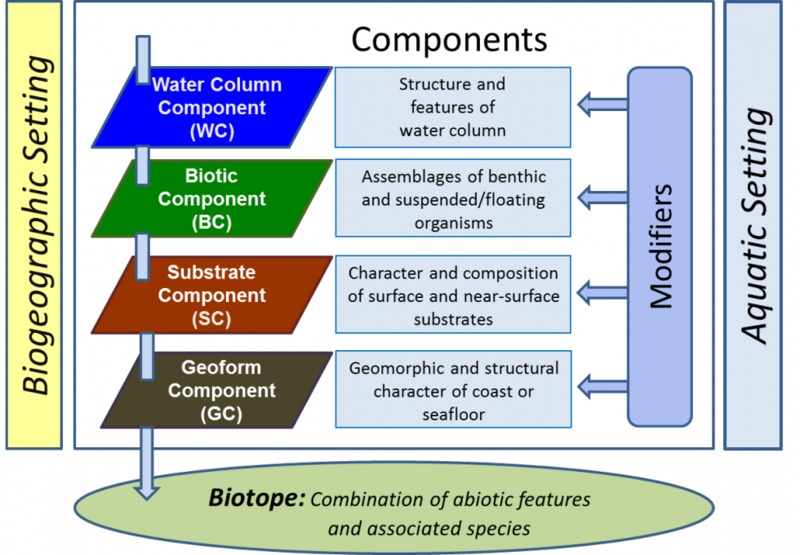 This combination of abiotic habitat information and their associated species will help define the CMECS biotopes (areas of uniform environmental conditions, habitat, and assemblages of animals and plants) for Oregon’s coastal and marine environment. Habitat association matrices for specific life history stages of Strategy Species provide information about the distribution of these species in the Nearshore (Table 6.3). Strategy Species that have any part of their life history commonly occur in a specific habitat are included in the species-habitat association. Readers should assume that information provided on species-habitat associations is based on published literature for the west coast of the U. S. and may or may not specifically be known for Oregon. However, there is Oregon-specific information available for many species such as kelp greenling (Figure 6.5). General habitat association matrices for Watch List Species and commonly associated species can be found in Appendix E and F, respectively. Photo Credit: © Janna Nichols. Figure 6.5. Kelp greenling in subtidal rocky reef habitat. Branta bernicla nigricans A Estuaries used by wintering and staging adults; feeds on marine and estuarine vegetation. Haematopus bachmani A, S/M, J A, S/M, J A, J Breeding pairs use same territory over many years; feeds on small mollusks and invertebrates. Nests primarily above the supratidal zone on both islands and rocky headlands. Pelecanus occidentalis californicus A Breeds and nests near coast but not in nearshore area. Feeds primarily on small marine fish. Hydroprogne caspia A, S/M, J A A, S/M, J Forages in bays and estuaries for fish. Nests on estuarine islands. Oceanodroma furcata A Breeds and nests in rocky cliffs or sandy burrows primarily on offshore islands. Forages at ocean surface. Oceanodroma leucorhoa A Breeds and nests on offshore islands. Forages by hovering or skimming over water; feeds primarily on small crustaceans. Brachyramphus marmoratus A Nests inland in old growth forests. Forages by diving; feeds on small fishes. Calidris ptilocnemis A, J A, J Forages in nearshore waters during winter. Fratercula cirrhata S/M, A Winters at sea, spends spring and summer months in the nearshore; nests on coastal headlands and offshore islands. Charadrius alexandrinus nivosus A, S/M, E/P, J Resident or short-ranged migrant. Raja binoculata A, S/M, E/P, J Soft seafloor spawning habitat. May be affected by wave energy development. Sebastes pinniger J A, E/P, J J L, J S/M Will inhabit artificial reefs. Sebastes nebulosus A, E/P, J L, J S/M Will inhabit artificial reefs. Oncorhynchus tshawytscha A A, J A, J A, J Anadromous; substantial data gaps regarding habitat usage in nearshore waters; sometimes caught near rocky reefs and in open neritic waters. Oncorhynchus keta A, J A, J A, J Anadromous; substantial data gaps regarding habitat usage in nearshore. Oncorhynchus clarki clarki A, J A, J A, J Anadromous; substantial data gaps regarding habitat usage in nearshore waters. Oncorhynchus kisutch A, J A, J A, J Anadromous; substantial data gaps regarding habitat usage in nearshore waters. 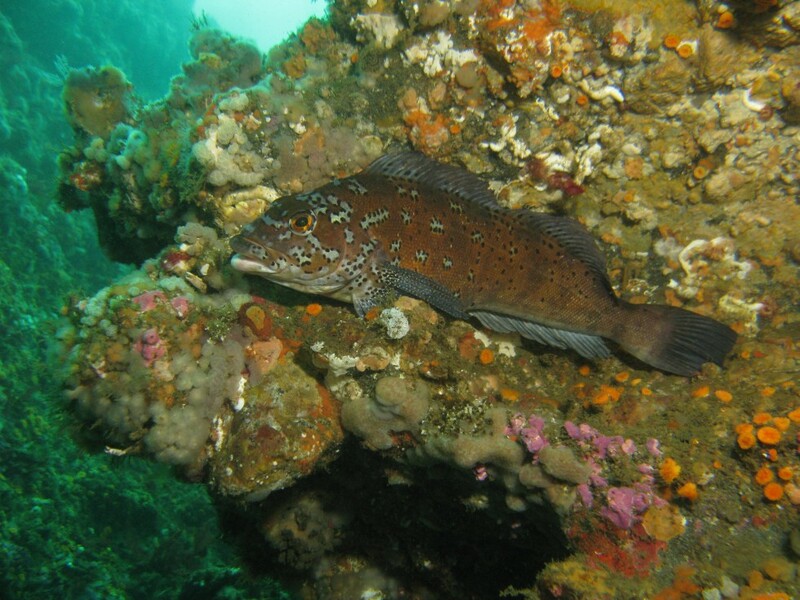 Sebastes caurinus A, J J E/P, J A, S/M, E/P, L, J Will inhabit artificial reefs. Sebastes diaconus J A, S/M, J J A, L, J A, J J Newly described cryptic species found in OR waters. Thaleichthys pacificus A, L, J A, L Anadromous; spawn in fresh water. Also school offshore. Sebastes rastrelliger J A, E/P, J J L Shallow rocky reefs; sometimes found in tidepools. Acipenser medirostris A A A A A, S/M, E/P, L, J Northern DPS listed as species of concern. Uses all nearshore waters and estuaries. Most marine-oriented of sturgeon species. Hexagrammos decagrammus A, S/M, E/P, J L, J A, S/M, E/P, L, J Will inhabit pilings and jetties. Ophiodon elongatus A, S/M, E/P, J A, J L, J A, S/M, E/P, L, J Will inhabit pilings and jetties. Engraulis mordax A, S/M, E/P, L, J Pelagic forage fish; commonly found in nearshore kelp beds and bays. Clupea pallasii A, J A, S/M, E/P, L, J Pelagic forage fish. Utilizes estuary spawning habitat in OR. Entosphenus tridentatus A Anadromous. Requires fine gravel beds in freshwater for spawning. Gaps in knowledge of habitats used in marine life history phase. Rhacochilus vacca A A A S/M, E/P, J Rocky shores; around kelp, pilings and underwater structures. Unknown habitat associations for some life history stages. Sebastes maliger A, E/P, J J L, J A, S/M, E/P, L, J Will inhabit artificial reefs. Amphistichus rhodoterus A S/M, J E/P Juveniles and adults found in estuaries along CA and OR coasts. Unknown habitats for some life history stages. Estuaries and sandy surfzone. Hexagrammos lagocephalus A, E/P, J A S/M, J E/P Found in subtidal algae beds and rocky reefs during spawning. Cymatogaster aggregata A A A, J S/M, E/P Adults are common in estuaries as prey for salmonids. Platichthys stellatus L, J A, S/M, J E/P, L A, S/M, E/P, L, J Will inhabit areas with pilings. Embiotoca lateralis A, J A A, J S/M, E/P Unknown habitats for most life history stages. Hypomesus pretiosus S/M, E/P S/M A, L, J A Extremely specialized habitat requirements for spawning beaches (temperature for substrate and air, light). Intertidal spawning habitat on beaches. Sebastes nigrocinctus A S/M, E/P, L, J Rocky reefs. Note that this is designated shelf rockfish in federal FMP, but defined as nearshore fish in ORS and is a component of both commercial and sport fishery harvest in nearshore waters. Will inhabit artificial reefs. Atherinops affinis A A A, J A, S/M, E/P, L, J Specialized spawning habitat in shallow waters with vegetation for eggs to adhere to. Sebastes miniatus A, J J L, J S/M, E/P Rocky reefs; life stage history gaps. Will inhabit artificial reefs. A Anadromous. Movements and habitat use of adult life stage for the approximately 10 weeks they are in marine habitats are poorly understood, but thought to be limited to nearshore and estuarine areas. Acipenser transmontanus A A, L, J Anadromous. Movements in marine habitats poorly understood. Anarrhichthys ocellatus A, S/M, E/P, J J L Benthic, rocky subtidal. Sebastes ruberrimus A, E/P, J S/M, L Will inhabit artificial reefs. Juvenile usage of nearshore. Sebastes flavidus J A, S/M, E/P, J A, S/M, E/P, J L, J Juvenile usage of nearshore. Upogebia pugettensis A, S/M, J Marine water dependent estuarine species. Mytilus californianus A, S/M, J A, S/M, J E/P, L Rocky intertidal, pilings. Cancer magister A, E/P, J A, S/M, E/P, J L A, S/M, J Oceanic conditions linked to larval survival. Will inhabit pilings. Haliotis walallensis A, E/P, J S/M, E/P, L Rocky subtidal, gaps in life history knowledge. Leukoma staminea A, J A, J A,J S/M, E/P, L A Marine water dependent estuarine species. Distinct from introduced Manila littleneck clam (Venerupis philippinarum). Pisaster ochraceus A, J A, J S/M, E/P, L A Rocky intertidal and subtidal. Keystone species. Recent population decline due to sea star wasting syndrome. Ostrea lurida A, S/M, E/P, L, J Shells occur on the outer Oregon coast and it may be possible that populations exist outside of the estuaries, but coast wide surveys have not been conducted. Enteroctopus dofleini A A, S/M, E/P, J A, E/P J Rocky shore, found in low intertidal. Strongylocentrotus purpuratus A, J A, J S/M, E/P, L Associated with habitat with adequate algae for foraging. Siliqua patula A, J A, J S/M, E/P, L Susceptible to disease and natural events such as El Niño. Increased occurrence of closures due to domoic acid concentrations in recent years. Haliotis rufescens A, E/P, J A, E/P, J S/M, E/P, L Do not mate at northern end of range (Cape Argo, OR). Red sea urchinMesocentrotus franciscanus A, J A, J S/M, E/P, L Adjacent to kelp forest habitat. Crassadoma giganteus A, S/M, J A, S/M, J S/M, L, J E/P Will inhabit pilings and jetties. Nereocystis luetkeana A, S/M, E/P, J S/M, E/P Shallow subtidal. Reproduce by spores, with alternating generations. Zostera marina A, S/M, E/P, J S/M, E/P A, S/M, E/P, J Angiosperm. Shallow estuarine and marine waters with muddy or sandy bottoms. Requires clear waters. Postelsia palmaeformis A, S/M, E/P, J S/M, E/P Mid to low intertidal. Reproduce by spores, with alternating generations. Phyllospadix spp. A, S/M, E/P, J S/M, E/P Low intertidal and shallow subtidal. Areas exposed to high wave action. Angiosperm. Eschrichtius robustus A, J A, J Mating and parturition occurs within lagoons in Baja California. Feed in soft bottom. Animals from Pacific coast feeding group summer in OR waters. Orcinus orca A, S/M, E/P, J A, J A, S/M, E/P, J Southern resident DPS have been tracked in OR waters. Mirounga angustirostris A, S/M, E/P, J A, J A, J A Mating and parturition is on sandy beaches. In OR pups have been born at Cape Arago. Eumetopias jubatus A, S/M, E/P, J A, J A, J A Mating and parturition on islands, rocky shores. Most reproductive activity in OR occurs on the south coast.